I talk to people all the time who are not happy with their life or current situation. It’s the nature of my job as a coach. Career, relationships, finances, health, you name it. My clients are always looking for ways to bridge the gap between where they are now and where they want to be. Because of all of these interactions, I also know that there are two main kinds of people. You’re either serious about changing your life, or you’re full of excuses. If you’re full of excuses, you have to face the facts. 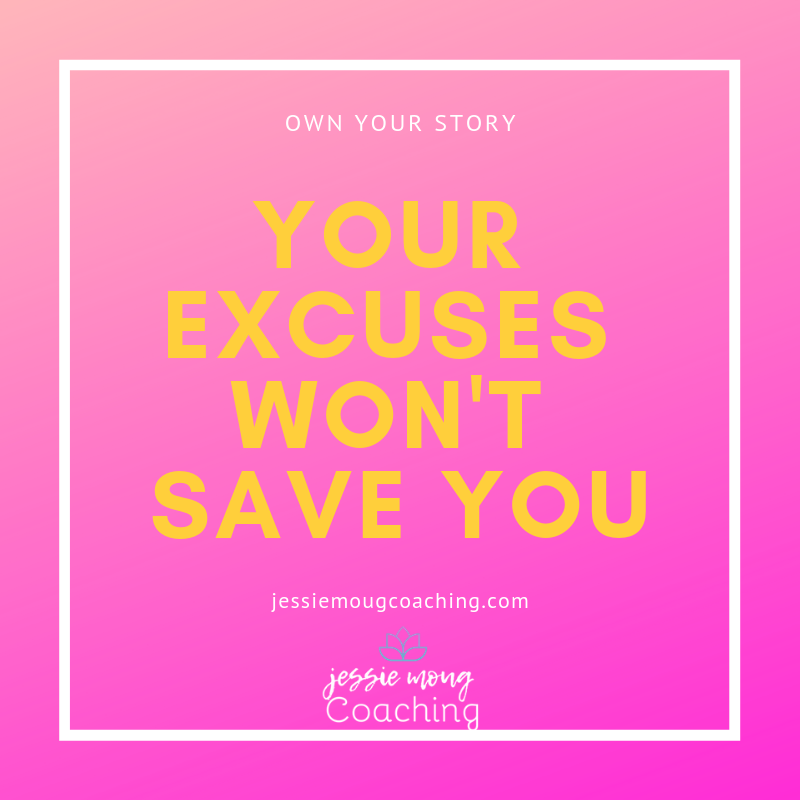 Until you step up and take ownership and responsibility for your own life and journey, you’re going to stay stuck in your pity party of one (or more, but that’s a whole other story about the company that you keep). Having all of the excuses in the world won’t save you. You’ll keep living the same experience until you decide to change. You can try to avoid it all you want, but it will keep showing up – similar experiences, relationships, etc. There’s nothing I can’t stand more than someone who refuses to see that they’re the one in control of their story and someone who gives up on themselves and accepts that they’re a victim. But there’s another kind of person. The person who’s serious about changing their life. My kind of person. If you’re serious about changing your life, you will find a way. It doesn’t matter what’s happened to you in the past, how many times you’ve been hurt, or failed, or fallen down. You’re not a victim. You know you’re learning from each experience you have, even if it’s an unpleasant one. You’re hell bent on getting what you want. You will never settle, and you will keep doing the stuff that scares you in order to learn and grow. You may be scared but you’re so courageous and you refuse to look back on your life with regrets. You know who you are, and you’re my people. What’s standing in your way right now? Is it those voices of doubt? Your fears and insecurities? Remember, you get to choose who you want to be. The victim, or the courageous inspiration that we all know you are! Jessie helps unstoppable women on a mission get out of their own way so they can own their destiny. Her mission is to uplift other women and show them just how powerful they truly are so that they can live the life of their dreams. Who are these unstoppable women and are you one of them?! You tell me and let's connect!